Told in three parts WIMMERA focuses on two people. In the first part we meet Ben and Fab; best friends in their final year of primary school. In their small rural town they are left to their own devices for great swathes of time. Not due to bad parenting but because that’s the way the world was then. The boys watch TV, play backyard cricket, go yabbying and camping. They can talk endlessly of mindless things such as the intricate rules for their favourite activities but they actively avoid discussing the big, scary stuff. Like why Ben’s 14-year old neighbour hung herself on the family clothesline or the fact that Fab’s father beats him regularly. No one, not even the adults, talks about those things. Towards the end of this part of the book readers know that something has gone awry for one of the boys but we have to speculate about the details. In the book’s second and third acts we find out a little more as the boys’ history is investigated, but even by the end of the novel there’s still a lot we don’t know. It doesn’t feel quite right to say I loved WIMMERA given it is so sad and full of melancholy. But what other word is there? I loved that it depicts an Australia I instantly recognised. Although it is set in rural Victoria I think WIMMERA owes more to its core events taking place in the late 1980’s than to its geography. Things – often awful or frightening things – that are known but not spoken of are at the heart of this story and that kind of secret keeping is – or was – not reserved for country towns. The inner-city street I grew up on was equally good at hiding things. That said, the book’s physical setting is utterly authentic too. I loved that the book’s central characters are neither heroic nor extremely flawed. They’re ‘normal’, for want of a better word. They do good things and not-so-good things and fumble their way through life, like most of us. Maybe other readers look for inspiration from fictional characters but I like it best when people in fiction are as clueless and awkward as I usually am. I loved that the book left so much unsaid. 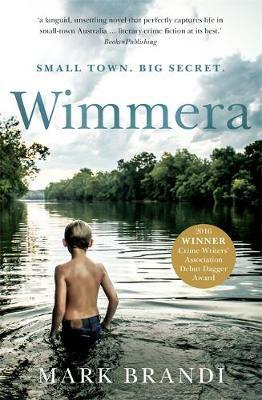 At 262 pages WIMMERA is one of the shortest modern novels I’ve read. And though it clearly annoys some readers I found the lack of detail very fitting. This is, after all, big scary stuff. Not the kind of thing people talk about. It feels very realistic to me that people like Ben and Fab – growing up when and where they did – would never tell all. Probably couldn’t tell all even if they had the desire to. Like its geographic namesake WIMMERA is quite beautifully sparse and reveals its secrets unwillingly. Surely only the hardest of hearts could fail to be moved by Ben and Fab’s story even though they struggle so hard to share it. Or perhaps because they struggle so hard to share it. Highly recommended.